On July 14, the P5+1 (the five permanent members of the United Nations Security Council and Germany) and Iran announced an agreement that could result in relief from United States and European Union nuclear-related sanctions (which include some oil-related sanctions). If the agreement is implemented and sanctions relief occurs, it will put additional Iranian oil supplies on a global market that has already seen oil inventories rise significantly over the past year. These additional Iranian supplies, along with relatively higher global oil production and comparatively slower global oil consumption growth, will contribute to large inventory builds next year, resulting in lower oil prices than previously expected. The North Sea Brent crude oil price, which averaged $57 per barrel in July, is expected to rise to an average of $59/barrel (b) in 2016, according to EIA's August 2015 Short-Term Energy Outlook (STEO). The previous outlook, published before the Joint Comprehensive Plan of Action (JCPOA) was announced on July 14, had anticipated 2016 prices at $67/b. Crude oil price forecasts are subject to significant uncertainty, as described in EIA's Market Prices and Uncertainty Report. The initial effect of the JCPOA on oil markets will come from the release of Iranian inventories. Of the estimated 30 million barrels held in storage, more than half is condensate, and the rest is mainly medium, sour crude oil. The volumes in storage could boost total global supply by about 100,000 barrels per day (b/d) by the end of 2015. This estimate reflects the difficulties of finding buyers for the stored condensate, although much higher volumes may be sold should Iran provide discounts to encourage purchases. The pace of the sales of oil from storage remains highly uncertain and will depend on the pace of sanctions relief and the availability of customers for Iranian oil and condensate. Iran may find it challenging to find buyers for the condensate, as current condensate prices indicate that consuming markets, particularly in Asia, are well supplied. By contrast, the crude oil held in storage could be sold more quickly, as price differences currently indicate more demand for medium, sour crude compared to lighter, sweeter crude. There is evidence that initial volumes are already moving out of floating storage. Iran is also expected to increase production as sanctions are lifted. 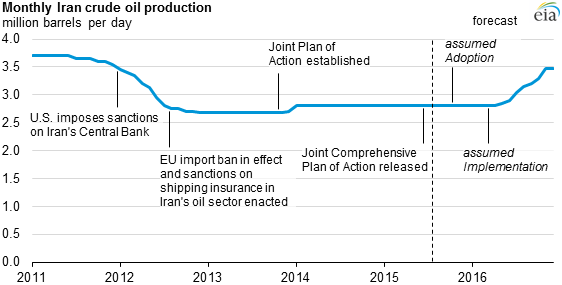 EIA estimates that Iran has the technical capability to increase crude oil production by about 600,000 b/d by the end of 2016. The pace and magnitude at which additional production volumes reach the market depend on how quickly Iran meets conditions triggering sanction relief and how successful Iran is in production and marketing operations. EIA expects most of this increase would occur in the second half of 2016. These additional Iranian volumes are expected to put downward pressure on global oil prices in 2016, as Saudi Arabia and the rest of producers in the Organization of the Petroleum Exporting Countries (OPEC) are not expected to make production cuts to accommodate additional Iranian volumes in a well-supplied global oil market. Lower world oil prices in 2016 likely will result in lower non-OPEC production and slightly higher consumption, largely offsetting the higher Iranian production. Non-OPEC producers are expected to see their output fall as a result of high inventory builds and lower prices. In particular, EIA's outlook for U.S. crude oil production was revised downward by about 400,000 b/d in 2016. Internationally, producers operating in high-cost areas, such as the North Sea and deep offshore in the Americas, are also expected to reduce output in 2016. However, the biggest declines in production among non-OPEC producers from lower oil prices are likely to occur beyond 2016, reflecting the effect of reduced capital expenditures and investment in conventional development projects with longer payback periods than projects with shorter payback times, such as tight oil drilling. Reductions in capital expenditures are most likely to affect producers in areas outside of the shale plays in the United States.